Galette des Rois is a real phenomenon in France, both commercially (you can't escape it, it's all over the boulangeries-pâtisseries-cafés-restaurants-supermarkets) and socially. You generally get together with your family to tirer les rois. In my family, the youngest would get underneath the table and shout out names to assign the slices of the galette to make sure the fève was randomly assigned. In reality, we would always try to assign the fèves (in some big galettes, there might be two) to the children... If you happen to have a big family, chances are you get multiple invitations to eat la galette. In addition, it has become a tradition to have one at the workplace. And most office cafeteria (or schools for that matter and no, I have never heard parents complain or threaten to sue for "potential choking hazard!!)) will also offer galette des rois for dessert during the first weeks of January. And ONLY during the first weeks of January for la galette des rois is a seasonal dessert. 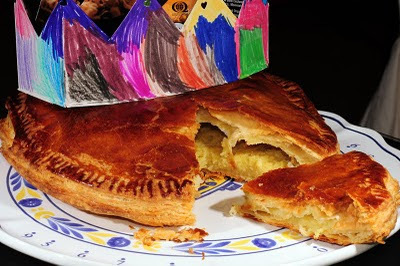 Yes, there is such a thing as a galette des rois season : tough luck if you want to have a galette des rois in the Summer because pâtissiers won't cook any for you. I had not come to realize the seasonality of la galette des rois until I decided to order one for my husband's birthday in February. Since it was impossible to find a galette des rois in Upstate New York where we were living, and since we were going to be in Paris around his birthday, and since he loves galette des rois, I thought that eating a galette would be a great surprise. My parents had a great pastry shop next to their apartment back then. His owner and pastry chef had the most adequate name for his job: Mr Gatault (it is pronounced the same way as gâteau, which means cake in French). Mr Gatault had a few good specialties, one of which was his galettes des rois. Well, Mr. Gatault could not make galette des rois in February. He could make a Pithiviers, which, while similar is not the same, but not galette des rois. I called a few other pâtisseries around and got the same answer. In a way, they must have thought I was crazy to want a galette des rois in the middle of February?!! We had Apfelstrudel instead! Since we could not purchase a galette des rois in the U.S, I once went to beg Mrs. Gatault to see whether her husband could make a few for me in December. She agreed (somehow, they must have been getting ready for the January season and had a few batches available) and I took 4 galettes back with me to the US. We froze them and ate them during the year. We kept the fèves and the following year, with no trip to France in December-January, we took on the long process of making one! We got the recipe from my godmother whose galette is very good... but the first one we made was WAY too heavy with butter and cream.. and there is nothing worse than eating a bad galette des rois. Even when you live in the US! Since then, my husband has taken over and improved his recipe. He is now the Roi de la galette des Rois... and is cooking a few galettes every year. A few, because, since I was born in January, this has become my favorite birthday cake (did I mention that I love galettes des rois?) And, since he only bakes them in January (he loves the seasonality!! ), we'd better take advantage of it, n'est-ce-pas? We had a friend visiting from Canada over New Year... and since it was la saison de la galette (ie. January), my husband made one for us. My daughter created the crown... and the "random" assignment of the slices made her la Reine! She was really really excited to get la fève. But she was not allowed to keep it in her treasure box because we'll need it for another galette! We were also very excited to see her eat it because last year, she was so afraid of choking on the fève that she would not want to eat galette! As for the rest of us, we enjoyed every slice and every crumb of it! I just can't wait for my upcoming birthday! Since it is a real effort to make the galettes des rois (making puff pastry dough, making the filling, etc, etc..) , I won't be publishing the recipe. If some of you REALLY want it, I'll add it to this post later. Recipe, please! We can't purchase la gallette in Canada either, and it's such a fun addition to family gatherings. Nous avons mangé de "La galette des Rois " aujourd'hui en France. C'est un très bon met, délicieux, qui fond dans la bouche et qui croustille..
Bravo pour tes connaissances etcommentaires. I would love if you could post this recipe. My husband's birthday is on the Feast of the Epiphany ( 6th Jan ) and this would be such a great birthday tradition for him. Please please pretty please post the recipe. Cette année, que d'innovations pour la galette... Après 4 années de régime "brioche bordelaise!" on a goûté la galette Dalloyau chez des amis... fourrée à la pomme et recouverte de feuilles d'or !!! Excellente ! Et à Strasbourg, on a essayé un très bon patissier... et là on a pu tester une galette frangipane chocolat avec des framboises... Là encore, c'était très bon ! Il y avait d'autres galettes à goûter mais avec le nouveau régime de Matt c'est le dessert complètement interdit!!! Wouldn't mind the recipe either - even though I can't make any dough whatsoever in this weather. The Singaporean galette we bought wasn't too bad. Eleonore had her first bite - we both like it sèche! Ben eats the frangipane lol.